Projects I'm Working On Now. Should you plan your own Memorial Stone before you need it? I try to price my memorial stones in a way that allows the average person to be able to afford them. The bottom line is, if you like my work, then I will do my best to make sure you can get it. If you like my work, then please help me promote it. Share my work by using the link below. My name is Roy Dixon, and I am the artist for Roberts-Shields Memorial Company in Marietta, Georgia. Our monument company was founded in 1898, making it one of the oldest monument companies in the country. I started creating personalized memorials in 1984. Although some of the tools have improved, most of the methods used to engrave, letter, and install today's headstones are the very same ones that were used more than a century ago. 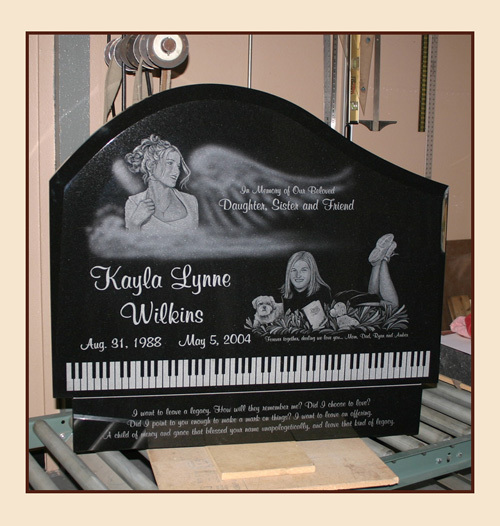 By working closely with you and your family and by listening carefully to what you have to say, I will start to get a feel for what you would like on your memorial stone. As you share your stories with me, we will begin to generate ideas. Next, I'll put these ideas on paper, where we will work together to refine them. When the drawings are just right, I will begin to etch in stone. If we work together, you and I can create a true memorial in every sense of the word. A tribute in stone to the people you love. I treat every stone as a work of art. Each piece is one of a kind, and handcrafted using the finest monument grade granite available in the world. I ship and install monuments anywhere in the country and arrangements can be made for overseas shipping as well. Your satisfaction is guaranteed by a series of approvals. Nothing is put on stone until a detailed layout is approved. After the headstone is finished you must then approve the final artwork before the memorial can be set at the gravesite. This final approval can be done by e-mail, regular mail or in person. Click Here To WatchThe Roy Dixon Video From Iowa Public Television's "Living In Iowa"
So take a few minutes to look at the memorials in the photo galleries. Read the letters and articles. My monument company can ship grave markers and headstones anywhere in the world. Feel free to contact me with your questions. You may be here looking for information on the memorial stone I am creating for Kay Yow. Coach Yow was the legendary Women's Basketball coach for NC State. She coached Team USA to the Olympic Gold Medal and has accomplished so much for women's athletics that I cannot begin to mention her achievements on this page. I have dedicated a separate page to this project. See the link toward the top of this page, or click here for the Kay Yow headstone project. I have also posted a couple of links to genealogy sites that may be helpful to those trying to trace their family history. Take the first step now, and Let’s create something beautiful, together.